Pets are diagnosed as overweight due to how much they weigh compared to their own past weight records as well as a physical examination. This means that only a veterinarian can truly diagnose a pet as overweight. If you are concerned that your pet has put on weight and/or might now be at an unhealthy weight, book in to see your veterinarian for a standard check-up. If you look at your pet and wonder if (s)he is overweight, observe a bit about your pet’s body and daily routine. For example, if you own a dog or a cat, can you feel his or her ribs or see an obvious waist near the hips? If you watch your pet closely can you see if (s)he has trouble starting or sustaining physical activity, or if (s)he seems excessively tired afterwards? Much like people, pets should be able to carry out a certain amount of activity without seeming winded or so tired that (s)he can not continue. 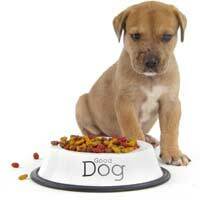 Also just like humans, pets only need a certain amount of food each day for optimal health. If you think your pet may be overweight, have a look at his or her meal schedule. Depending upon your type of pet, re-read the directions on food containers (such as for fish) or speak to a veterinarian to determine what should be fed, how much should be fed, and how often it should be fed. If you are interested, you can also ask a vet about your ability to make your own pet food to be absolutely certain of what you are feeding your pet. If you have been observing your pet and his or her meals and you have cause for concern over his or her weight, book in to see your vet. Ask for a regular check-up and discuss your weight concerns. If it does turn out that you’re pet has put on weight, ask your vet if there could be a medical condition that brought it about. Also make sure to ask your vet for suggestions on how to help your pet slim down and encourage an active lifestyle. These are not absurd questions, so don’t feel like a failure or an unfit owner if you need a little help in the right direction. Depending on the type of pet you own, there may be many activities that you can engage in to help him or her slim down and become more healthy. Dogs, for instance, can accompany their owners on walks and jogs as well as play fetch or be let loose at a dog park. Cats can play with toys or be given free reign of a climbing tree. Hamsters and mice can run on wheels or through mazes. If you feel that your veterinarian has not offered enough suggestions on how to exercise your pet, check in at a local pet shop to see if they have any recommendations. If you suspect that you have an overweight pet there is much that you can do to deal with the situation. Observing your pet’s body and abilities, monitoring your pet’s meals and snacks, taking your pet in to see a veterinarian and making exercising with your pet a priority are just a few of the ways that owners can cope with a pet’s weight problem.